Ségou (also Segou, Segu, Seku) is a town and an urban commune in south-central Mali that lies 235 kilometres (146 mi) northeast of Bamako on the River Niger. The town is the capital of the Ségou Cercle and the Ségou Region. With 130,690 inhabitants in 2009, it is the fifth-largest town in Mali. The village of Ségou-Koro, 10 km upstream of the present town, was established in the 17th century and became the capital of the Bambara Empire. In the middle of the 19th century there were four villages with the name of Ségou spread out over a distance of around 12 km along the right bank of the river. They were, starting from the most upstream, Ségou-Koro (Old Ségou), Ségou-Bougou, Ségou-Koura (New Ségou) and Ségou-Sikoro. The present town is on the site of Ségou-Sikoro. The village of Ségou-Koro prospered after Biton Mamary Coulibaly became king in 1712 and founded the Ségou (or Bamana) Empire. Mungo Park became the first European known to have visited the village in 1796. The empire gradually declined and was conquered by El Hadj Umar Tall's Toucouleur Empire in 1861, then by the French Army Colonel Louis Archinard in 1890. Ségou has contested origins. Some claim that the word Ségou come from "Sikoro", meaning to the foot of a shea butter tree. 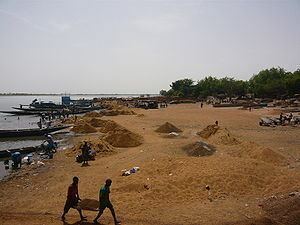 Others argue that it was named after Cheikou, a marabout who founded the city, while still other theories support the claim that Ségou was founded by the Bozo fishermen coming from the north, who established their villages along the Niger River. The 11th century CE saw an influx of the Soninke people, who were trying to escape from the expansion of the Ghana Empire, with Mandinka populations following. It is believed that Kaladjan Koulibaly, founder of the Bambara Kingdom's Koulibaly dynasty established the first sedentary villages here at his time. The later Diarra dynasty moved the capital of the Bambara Kingdom to Ségou. Ségou Koro is located about ten kilometres from Ségou, on the road to Bamako. Segou Koro was created by the founder of the Bambara dynasty. During the 17th century, Bambara coming from Djenné, led by Kaladjan Koulibaly settled along the Niger River. Danfassari, Koulibaly’s son continued his father’s work by building his city there. After Koulibaly’s death, his eldest grandson Mamari—also known as Biton—ruled the city and made it flourish. Today the town in some ways conserves the tradition and architecture of the ancient city. The Bambaras from Djenné with Kaladjan Koulibaly established their nation along the Niger River and founded the town of Ségou-Koro, the capital of the Bambara state. Bortolot (2003) says that Ségou evolved from a simple social structure, characterized by hunting and farming, to a more complex city dominated by a dynasty system. One of Koulibaly’s descendants, Mamary Coulibaly, became the chief of the Bi-Ton and later took the name Biton. Biton spread terror, organised the army, and restructured the association into a city. He expanded the territory from Segou Koro to Timbuktu. Under his rule, the Macina and Djenné trading centers became a part of Ségou. Timbuktu was not part of Ségou. It remained autonomous and paid tribute to Biton. After Biton’s death in 1755, one of the Coulibaly family slaves, Ngolo Diarra, obtained power to control the Bambara kingdom and established the Diarra dynasty. Ngolo Diarra ruled Ségou until the 19th century. He moved the kingdom's capital from Segou-Koro to Ségou-Sikoro, close to the site of the current city. Diarra continued Biton’s conquest and extended the kingdom from Guinea to Timbuktu. In March 1861, the Muslim Toucouleur leader, El Hadj Oumar Tall, conquered the town. On his death in 1864, he was succeeded by his son Ahmadu Tall. Ahmadu had to deal with Bambara rebellions and challenges from his brothers but he continued to rule until 1890 when the town fell to French forces led by Colonel Louis Archinard. 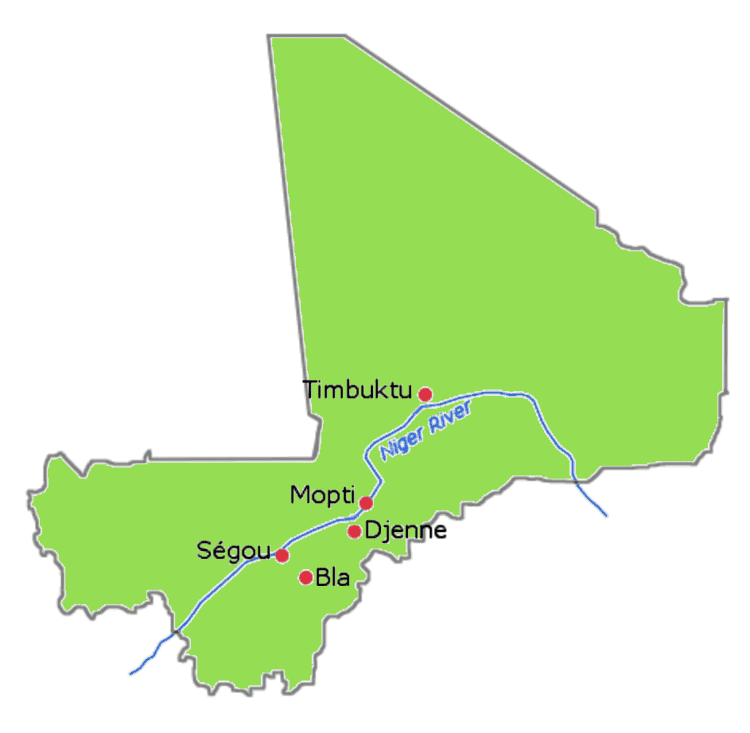 Ségou is situated 235 km from Bamako, on the right bank of the Niger River. 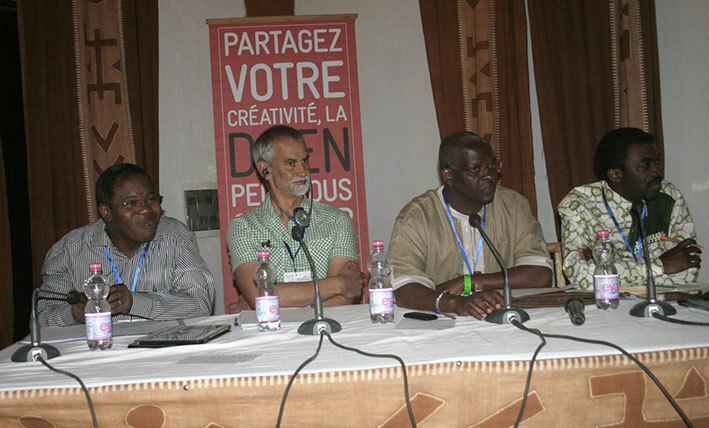 The urban commune is bordered to the east by the commune of Pelengana, to the west by the commune of Sébougou and to the south by the commune of Sakoïba. The commune is subdivided into 15 quartiers: Alamissani, Angoulême, Bagadadji, Bougoufié, Comatex, Dar Salam, Hamdallaye, Médine, Mission Catholique, Missira, Ségou Coura, Sido Soninkoura, Somono, Sokalakono, Bananissabakoro. The Ségou region is characterized by a semi-arid climate and irrigated by two important waterways: the Niger and the Bani River. Ségou has two seasons: a rainy season and a dry season. The rainy season starts in June and lasts about four months until September. Ségou's dry season includes a cold period and a period of heat. The average yearly rainfall is about 513 mm. The harmattan is the dominant wind in the dry season and it blows from north to south. The monsoon blowing from south to north-west is more frequent during rainy season (hivernage). The Ségou Region’s population was about 1,769,201 in 1998. With a rural population that is largely nomadic semi-sedentary or sedentary, the population consists of many ethnic groups, such as Bambara, Bozo, Fulani, Soninke, Malinke and Toucouleur. Bambaras are mostly farmers and are the most numerous ethnic group. Their language is Bambara or Djoula. The Bozos are the second most populous ethnic group. They typically live near the shore of the Niger river, in small towns of small houses. The Bozo economy is based on fishing. Bozo people have a monopoly on the transport system because of their knowledge of the Niger, its shallows and seasonal lakes, and are regarded as the masters of water. The Somono, also fishermen, are not a distinct ethnic group but a mixture of Bambara, Bozo and Soninke. The Malinké, Maninka, and Mandinka are closely related to Bambaras: They share costumes, religious beliefs, and practices with the Bambaras. The Marka, Saracollé or Soninke are merchants and warriors. The Soninke people are great travelers and Muslims, and have largely conserved their traditions. The Bambaras used to transmit their knowledge by oral tradition, hence much of their art and culture is unknown. Ségou’s cultural heritage includes traditional musical instruments, wonderful griots, folkloric groups and the traditional masks and marionettes. The history of the Bambara state’s traditional religious practices are ambiguous. They practice animism and fetishism as cultural practices, and also totemic and monism (cult of ancestors). The most famous Ségou handcrafts are based on pottery, weaving (blankets, wrappers and carpets), manufacturing of Bogolan (a distinctive variation of Mud cloth), painting and sculpture. Ségou is also regarded as the capital of Malian pottery with a large pottery district in Kalabougou situated on the left bank. Women make the pottery by hand with the clay coming from the Niger River and bring the finished works to the local Monday market. Ségou has two architectural styles: French Colonial and traditional Sudanese and neo-Sudanese. The Sudanese style influenced public building and important residences. Monuments and great mosques are also built according to this style. Many of Sudano-Sahelian's kings built imposing palaces in the cities over which they ruled and most of these buildings are in red clay. The materials used for building are generally quite poor and many of the buildings need to be restored to maintain their state. Today, Ségou is known for its pottery, its market and its fishing industry. 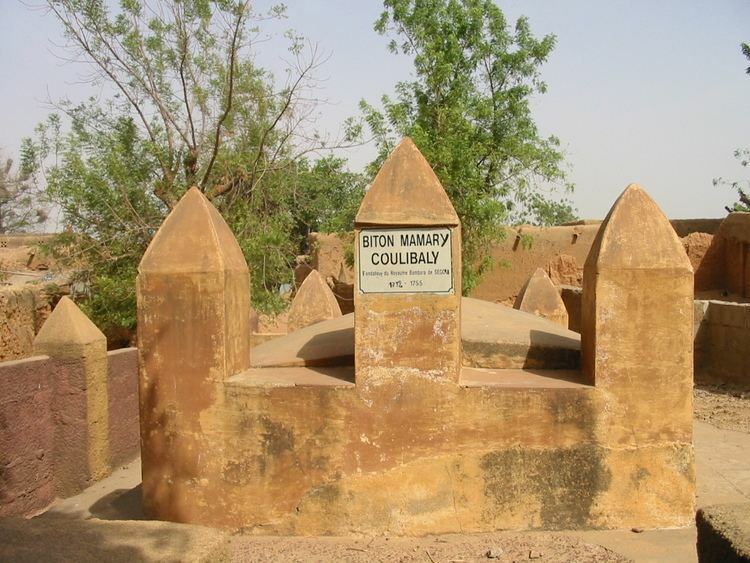 Attractions in the old town of Ségou-Koro included a mosque, Coulibaly's tomb and an ancient tree. In the city center, the main landmark is the water tower. The most important economic activities are fishing, cattle herding and small scale farming. The main crop is rice pearl millet but sorghum (Sorghum bicolor) and black-eyed peas are also grown. The yields are generally low. There are two factories processing cotton: Compagnie Malienne des Textiles (COMATEX) and Compagnie malienne pour le développement du textile (CMDT). Commerce consists mostly of the small scale exchange and sale of products from the primary sector, sold weekly at the large Sudano-Sahelian market, drawing customers from far outside of the city. The main products sold are vegetables, pottery, cotton, leather, fruit, ovens, cattle and cereals. The headquarters of the Office du Niger is based in the town. The Office du Niger is a semi-autonomous government agency that administers a large irrigation scheme in the Ségou Region to the north of the Niger River. Notable people from Ségou include Adame Ba Konare, Fanta Damba, Garan Fabou Kouyate, Mountaga Tall, and Bassekou Kouyate. Maryse Condé's historical novel Segu tells the city's history from 1797 to its 1860 defeat by El Hajj Oumar Tall's army.